Programmed Death Ligand 1 (PD-L1, also known as B7-H1) is an immune checkpoint expressed on the surface of tumor cells or on the surface of host immune cells adjacent to the tumor microenvironment. The humanized PD-L1 mice are a good in vivo model for validating the efficacy of antibodies targeting human PD-L1. Programmed Death Ligand 1 (PD-L1, also known as B7-H1) is an immune checkpoint expressed on the surface of tumor cells or on the surface of host immune cells adjacent to the tumor microenvironment. PD-L1 binds to the PD-1 receptor expressed on the surface of T lymphocytes and transmits an inhibitory second signal, thus inhibiting the activation of T cells or other immune cells. 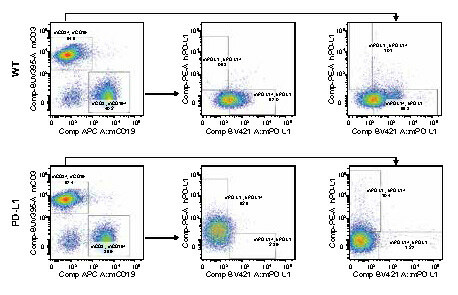 Because T lymphocytes play an important role in anti-tumor immunity by mediating the adaptive anti-tumor immunity, the high expression of PD-L1 in the tumor microenvironment can significantly inhibit the function of tumor infiltrating T cells, thereby allowing tumor cells to escape immune surveillance. PD-L1 is widely and diversely expressed in most malignant tumors. In many cancer patients, including lung cancer, melanoma, kidney cancer and urothelial carcinoma, the inhibition of PD-L1 expression facilitates extending overall survival. The expression of PD-L1 is induced by intrinsic and extrinsic signals of tumor cells. Intrinsic signal: PD-L1 expression can be promoted by the activation of protein kinase B (PKB), signal transducer and activator of transcription 3 (STAT3), KRAS and EGFR signaling pathways. Besides the constitutive expression of PD-L1 with the presence of tumor cell intrinsic signals, PD-L1 expression can also be induced by extrinsic signals Interferon-c secreted by the infiltrated immune cells was required for PD-L1 induction. Three humanized monoclonal antibodies, Atezolizumab (MPDL3280A), Avelumab (MSB0010718C), and Durvalumab (MEDI4736), bind to PD-L1 and have shown significant therapeutic effects in clinical trials. Figure 2. 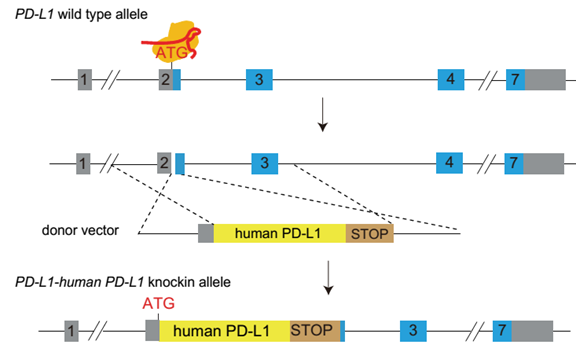 Generation strategy of humanized PD-L1 mice. On the C57BL/6J genetic background, the protein coding sequences for human PD-L1 were inserted into the ATG position of the mouse Pd-l1 gene, so that the expression of endogenous Pd-l1 in the mouse was replaced by the expression of fully humanized PD-L1 protein. Figure 4. In vivo validation of anti-tumor efficacy in a MC38 tumor-bearing model of humanized PD-L1 mice. Homozygous humanized PD-L1 mice were inoculated with MC38 colon cancer cells (expressing human PDL1 rather than murine PD-L1). After the tumors grew to 100 mm3, the animals were randomly assigned into a control group and a treatment group (n=5). The results showed: The antibodies targeting human PD-L1 were associated with a very significant anti-tumor effect (TGI: tumor growth inhibition, p < 0.001), demonstrating that the humanized PD-L1 mice are a good in vivo model for validating the efficacy of antibodies targeting human PD-L1.